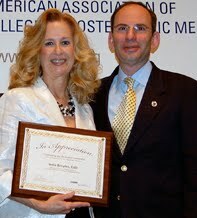 India Broyles, EdD (COM, Director of the Master of Science in Medical Education Leadership) has returned from the AACOM annual meeting where she received an award of appreciation from the Society of Osteopathic Medical Educators for her leadership over the past two years in the development of the OME International Collaborative. In addition, she chaired the OME International Collaborative planning session and writing of By-Laws. Dr. Broyles also served as moderator for a panel presentation titled Five Doors to Excellence in Medical Education Assessment. Evelyn Schwalenberg DO (COM) and Elisabeth Del Prete DO (COM) were panelists who shared their final projects from MEL 606 Learner Assessment and Program Evaluation. Polly Leonard DO (Kent Hospital DME/UNECOM clinical campus) and Amina Sadik PhD (Touro University COM) were also panelists from the Master’s program.